Oooh. Another high quality PN. I can see some PN tasting parties, featuring this and the Coppola. Which will win? On edit: I just noticed these bottles are screw top. By far the most expensive bottles we’ve seen in a screw top! Obviously this winery is not afraid to make changes. also, just because i love talking with myself, when i was bumming around some of the paso-robles and santa cruz area wineries, i saw a large percentage of wines offered were pinot noir. is this a particularly good region for this grape? Side deal with Stuart? What’s the connection? I did not guess this, and I am anxious to hear from others and the winery on this. Looks promising. I will be back after I do some more research! Hopefully this will kick Coppola down the block. I did a couple of quick checks, and made a phone call, this looks like primo Pinot…hehee anyhow, I got two, woo! Lets hope this wine is divine. These wines are $30 each there. The principals appear to be quite young. No wine club, evidently. I’ve had the Ray’s Cuvee before. Don’t know if it was the same vintage, but I’m in for 3. Again with the screw cap! High quality AND easy access? If MA was on the list, I would be in for 2. Will wait to see if comments push me to send yet another to backup in CT (where there are too many wine.woot boxes to ruin my welcome there already)! OK I’ve seens Cuvee a lot. What is that? Is that a special grape, vineyard, what? I just had the FFC pinot this week and it was quite delicious. Oh my. I don’t know how to resist a Pinot. Well luckily I’m hellabusy getting ready for my tradeshow that I won’t be tempted till Sunday. It seems these are produced in very limited quantities… 175 - 180 cases. I expect a sell out, assuming we have good participation from the winery. So I would not plan on waiting until Sunday. Cuvee is a wine term that’s used a lot. Not a grape or a vineyard, try google. So according to Wine Geeks the location of the La Vie vineyards (Santa Rosa AVA) is ideal for Pinot and Chardonnay. The Santa Cruz area is considered a Pinot Paradise, who knew?..well I am sure some of you did. There is another article about the Santa Cruz AVA here. You may have found it already, but Cuvee is typically a reference to a * blend*. 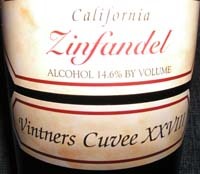 In this case Ray’s Cuvee is a blend of Santa Lucia (85%) and Santa Barbara County (15%) pinot grapes. pretty much anything costal and cool is good for pinot since its such a tempermental grape. I figure its only 30 miles away from Santa Rita aka california pinot paradise it should be good. i kinda wish they had some of their fiddlestix pinots or santa rita, both have great reviews, those would be tasty. But i’ve never had a SC one, very interested. 2004 was also an amazing year for alot of pinot’s. Oregan’s williamete valley had an amazing year, i believe it is very possible central california had a great year too. Right now the only pricing i could find for this wine is wine-searcher. 27.99 for the pretty in pinot. Couldn’t find anything on the 2nd wine. this seems to be a small vineyard, very few people have it on CT nor is it prevalant online. Definitely give it a shot if you like pinot, screwtops are also great, getting pretty big, especially in Australia + new Zealand. I was reading, they say wine ages better on screwtops *(shrug no idea if that’strue, but no corking!) but i can’t believe that, since cork let’s the wine breath while aging… unless the bottle has enough air inside? shrug! sigh, i just spent 700$ on pinots from sea smoke, damn you wine woot!